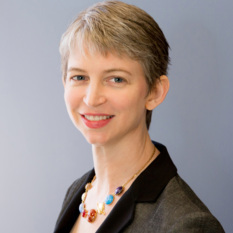 Yesterday Nancy Atkinson over at Universe Today wrote a very helpful post describing the final eleven Space Shuttle launches, ten of which are to complete the assembly of the International Space Station. (The eleventh is to perform the final Hubble servicing mission.) That post spurred me to run through a little project I've been wanting to do for some time, combing the NASA archives for photos that document the assembly of the International Space Station. This turned into quite a puzzle, as I haven't paid very much attention to the Space Station so couldn't automatically recognize all the different components in the photos. Fortunately NASA offered me a head start with a handy gallery of selected images documenting the assembly. They also have a site that describes the parts of the space station, which was moderately useful, except that it's way out of date, failing to give information on when some of the pieces were launched. For that, I found the ESA website to be more useful; they have a "Building the ISS' site that documents (among other things) each mission's payload, though the information is provided in an annoying user interface with not one but two unnecessary separate popup windows. So with that preamble, here are some photos that document the assembly of the Space Station. I selected only those photos that were taken with black space as a backdrop, and tried to orient them all similarly (though the fact that the Station is three-dimensional and not planar frustrated that effort). I also resized them to have comparable scale of, very approximately, 10 centimeters per pixel when enlarged. These six images document the early assembly of the International Space Station, from 1998 to 2001. Click through for more information on the different stages of assembly. 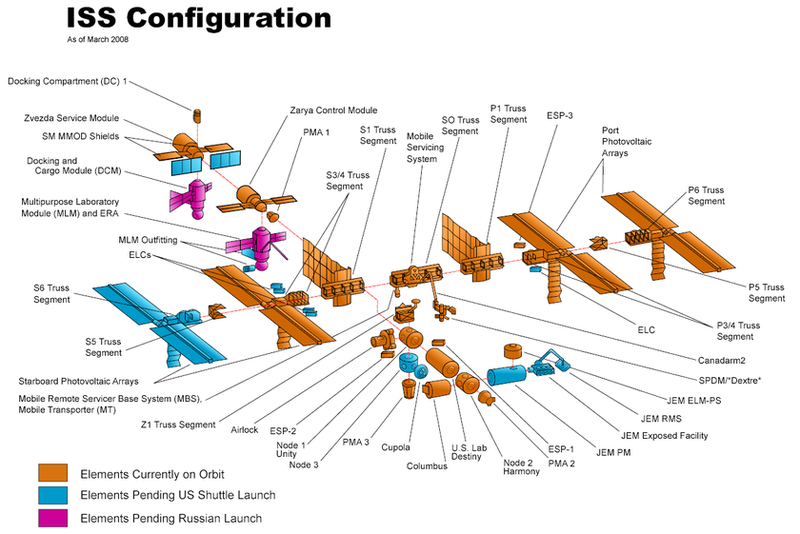 June 12, 1998: the Zarya ("Sunrise") control module and solar panels. December 15, 1998: Now Unity (Node 1) has been added. September 18, 2000: the Zvezda (Star) service module has been added; a Progress supply ship is also docked. 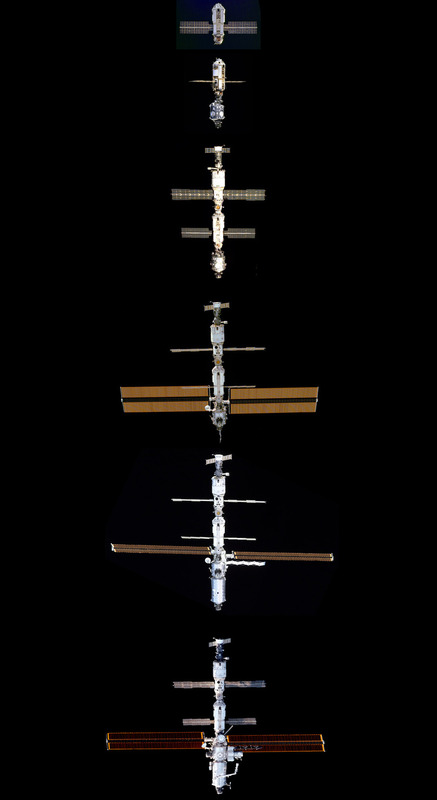 December 9, 2000: the P6 truss and solar arrays vastly increase the station's apparent size. February 16, 2001: the Destiny laboratory has been added. July 21,2001: The Quest airlock is attached to Unity, and Canadarm 2 to Destiny. Not yet in this sequence is the first part of the Japanese Kibo module; I didn't find a great picture including it in the archives. I'm sure many of you readers are much more familiar with the Space Station than I am; please feel free to speak up with any corrections or to expand on my captions! According to this diagram, there's still a lot of assembly left to do in those ten remaining Shuttle launches.Thanks to a reader who pointed out to me a much more up-to-date diagram of the planned components of the Station than the one I had here yesterday; the prospect of finishing its assembly in the ten remaining Shuttle launches now seems much more realistic to me!